I love leeks. I always keep a pack of frozen sliced leeks in the freezer all year round. They are so versatile they can be used in so many dishes both to add flavour and to bring out the best in other flavours. But I love it most when November comes around and fresh leeks are in season so I can use them in my cooking again. They are brilliant in so many homely hearty autumn and winter dishes - just think of how amazing mash tastes with sauteed leeks mixed into it. Think of all those creamy warming dishes and sauces that are made perfect with leeks. Yep - leeks are definitely a must-have winter ingredient for us! British leek season runs from November to April so theres plenty of time to use them in your family meals. Here's a simple, yet very tasty, recipe which gets the leeks tasting all zingy and zesty with some flavours less often used with leek but which really go well together. 1. Pre-heat the oven to 180C. Lightly brush a baking tray with olive oil. 2. Unroll the puff-pastry and place onto the baking tray. 3. Wash the leeks well and finely slice. Sauté in a little olive oil for a few minutes until softened. I happened to buy trimmed leeks, but even if you buy leeks which are green and leafy then as long as you wash them well you can still use the whole leek as the vibrant green will look great in this dish. 4. Grate in a little fresh ginger (approx half a teaspoon). Crush and add the garlic clove. Then add the cumin, coriander, paprika and cinammon. 5. Add the zest and juice of half a lemon. You may not need all the juice as you don't want the mixture to be too wet. A couple of squeezes of lemon is usually enough. 6. Finely slice the peppers and add in. Saute for a couple more minutes then turn off the hob. 7. Tear the mozzarella into small pieces and scatter onto the puff-pastry, leaving the edges clear to allow space for the pastry to puff up. The mozzarella is in place of using a 'sauce' on the pizza base. 8. Spread the leek mixture on top of the mozzarella then sprinkle on the crumbled feta. 9. Brush the edges with a little olive oil. 10. Bake in the oven for 20 minutes until the pastry starts to brown a little. This is great for all the family to enjoy together as a family meal. I also love the versatility of this recipe as it can also be easily adapted to make a starter or canapes for a party simply by cutting the pastry into smaller squares before adding the toppings. The zingy zesty flavours of the lemon, ginger and spices just taste amazing in this leek recipe! 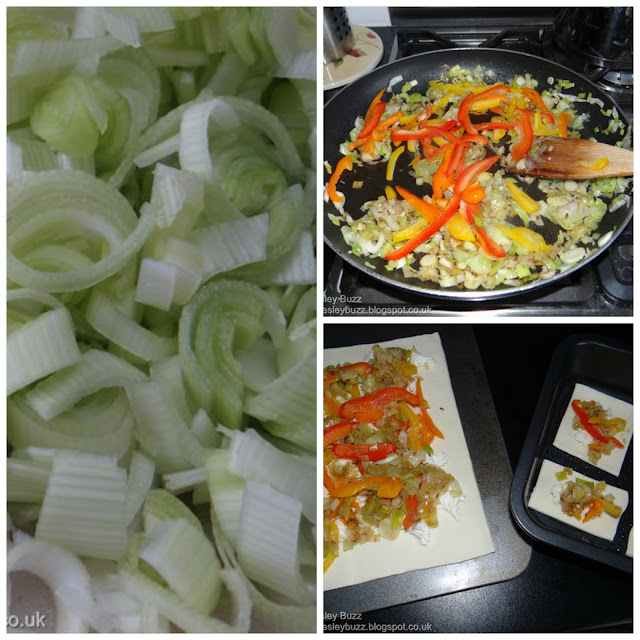 This is my recipe entry into the #LoveMyLeeks competition at British Leeks. Find out more about the competition here. I know just what you're thinking...oooh nice new blog header. Yes it was time for an updated look and as we've always muddled through doing our own (very basic) designs it was really nice to have this header done professionally for us by the very talented Charlotte at F&R Designs. 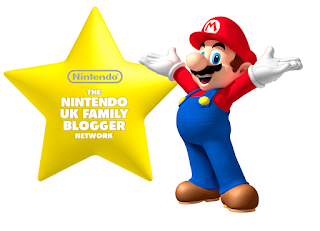 We'll gradually roll out the new logo to our social media platforms but just wanted to get it up onto the blog first. We were extremely lucky to have won the chance to have our blog header designed by F&R Designs and we are so happy with the outcome. We told Charlotte the background to our blogname and how it is a play on words with our surname being Beesley and so we've always had bees feature somewhere on our header. She put some thought into it and came up with the idea of incorporating the Bee theme into our actual blog name for the design. Genius. Thanks so much F&R Designs for our new look! We love making the Phenomenal Dark Chocolate Beetroot cake from Abel & Cole's recipe book. We've tried various versions of beetroot and chocolate cake but this one usually turns out the best. I think by whisking the egg whites separately and then folding them in helps prevent the cake feeling too 'heavy' although it still has a yummy gooey fudgey texture to it. 1. Pre-heat the oven to 180C. Grease and line an 8 inch tin. 2. break the chocolate into chunks and whilst the oven is pre-heating pop it in the oven in a heat-proof bowl for just a few minutes to melt. Pop the beetroot puree in a separate dish in the oven to warm through slightly for a few minutes too. 3. Mix together the beetroot, chocolate and ginger and leave to one side. 4. Next sift the other dry ingredients together into a bowl. 5. Whisk the egg yolks, Stork, yogurt and sugar. This started to separate a little so I added in a little of the flour at this stage. 6. Whisk the egg whites until stiff. 7. Now it's time to combine the 3 mixtures by folding carefully - First fold in the flour into the egg yolk mixture, then fold in the egg whites, then finally carefully fold in the beetroot / chocolate mixture. 8. Pour into the cake tin and bake in the oven for 50 minutes (check after 40 minutes and adjust time if necessary - in my oven 50 minutes was the perfect time). This tastes amazing on it's own but to add a little extra sweetness you can ice it with a buttercream or cream cheese frosting. We used a mix of butter and cream cheese with icing sugar and a touch of vanilla extract. The quantities were 260g icing sugar, 75g butter, 75g cream cheese, half a tsp vanilla extract. I think it would also taste great with a Chocolate Cream Cheese frosting like the one we made here. Orange or lemon zest on top as a garnish looks great or you could decorate with chocolate sprinkles. 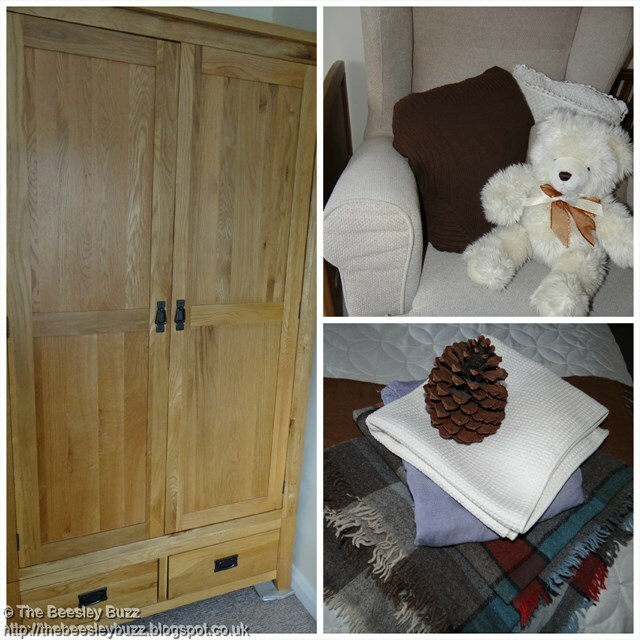 This time of year, as the weather turns colder, I love to stay indoors more and keep cosy and warm. 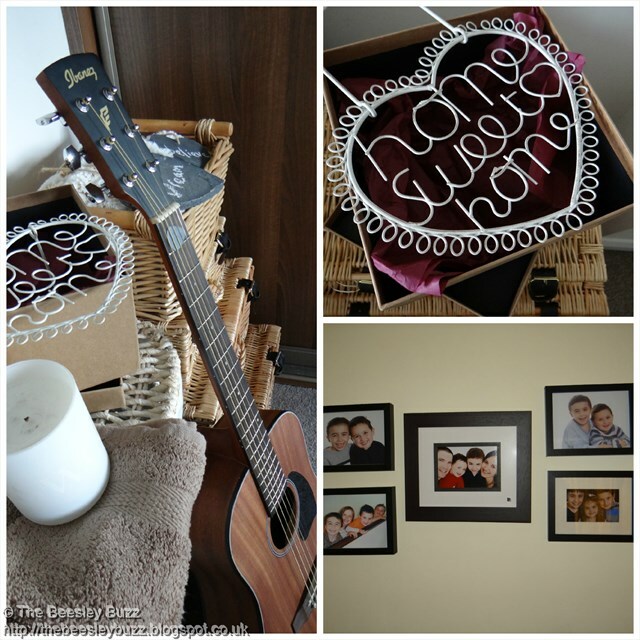 The Betta Living #BettaWinter Challenge was the perfect opportunity to revamp a room to make it cosy for winter. I decided that I wanted to give my bedroom a winter makeover but with the expense of Christmas coming up, I knew I had to do it without breaking the bank. 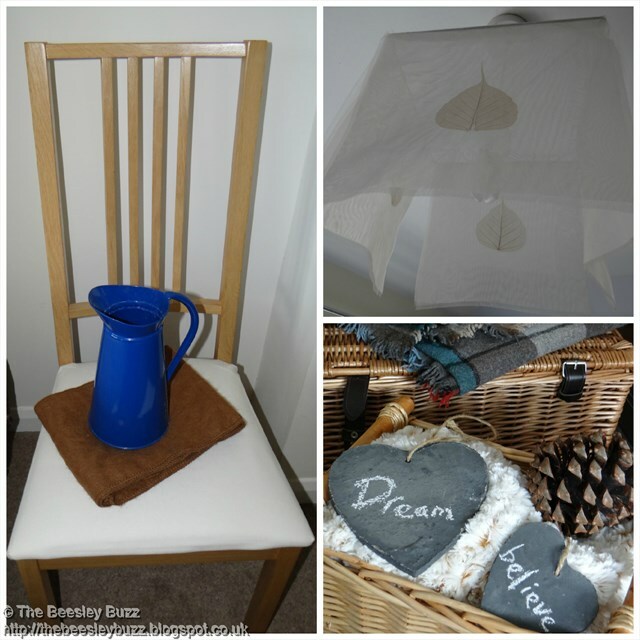 I looked at ideas on pinterest and started looking at accessories in the shops and online. I love the scandi-style winter look where they manage to achieve a cosy feel, yet keep the cool scandi colour scheme - the greys and blues and whites. Different shades of wood complete the look. I knew I didn't have quite the right items to achieve the ideal look I dream of, but I knew there was a way of making our room a little more cosy for winter. 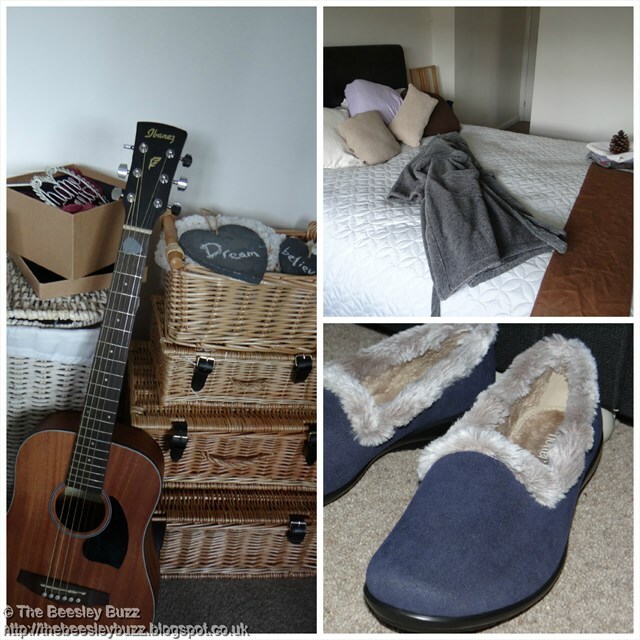 In the end instead of splashing out on new items, I used various items of furniture, soft furnishings and accessories from various places around the house and all brought into the bedroom started to make things look cosier for winter. The bedspread was reversed to give a more natural colour rather than the shimmery brown colour on the other side. A cosy robe and slippers is also a must for winter! You can find out more about Betta Living here and find out more about the #BettaWinter challenge here. Everyone who knows me realises that I am no sports player. No fitness fanatic. No gym bunny. J is as energetic as it is possible to be, D is a great creative force, T is a true dancer. But me - no, running around is not something I enjoy. So when we were given the chance to review 'tennis' I was unsure... until I realised it was Mario Tennis: Ultra Smash on the Nintendo Wii U ! That changes everything. Even I can run around on an electronic tennis court! Playing as Mario - a great all-rounder. As we have come to expect from Nintendo games, this is an excellent Mario take on the real-life game. You can choose which character to play as (I like to be the great all-rounder, Mario himself) each with their own strengths which you will recognise from other games in the Mario family (strength for Bowser, Speed for Yoshi and so on). You can choose between different game types, too - from rally practice (where you try to get the longest possible rally), to a traditional game, to a Knockout Challenge where you have to win to stay on and play another character, to the full Mario-experience Mega Battle. Of course, there are special shots, trick shots, power shots, and that Mushroom that makes you a giant. Each character becomes a giant if they run over the mushroom, making it easier to hit the ball and making the shots faster. The controls are really easy - use the joystick to move to where the ball is heading, then press any of the buttons (A, B, X or Y) to hit it back. It very rarely goes out or hits the net (and then it is because you didn't get to the ball in time). More complex shots can be achieved by being in the right place (a coloured marker on the court that appears) and pressing the right combination of buttons (which also appear so you know what to do). These make it easier to win the point, but you can play without them. And, of course, the more games you play and points you win, the more special settings you unlock. The boys love the 'mushroom court' which adds plenty of bounce; I liked the Bounce-out court, which spins the ball to the edges when it bounces, making it hard to return. There are a range of courts to choose from, and more to unlock later on. My favourite is the Bounce-out court. With both singles and doubles games available, and the option to play against others over the internet, there really is a huge amount packed into this game. Up to four players can join in (although it was also fun to play two-against-one when only three of us wanted to join in, creating more of a challenge!) and there is also fun to be had with an amiibo - you can have him play alongside you, and he improves in each game to make a more formidable team. One of our favourite little extras is the unique responses from each character when they lose a point - from simply saying 'oh no! ', through to sobbing and throwing a tantrum, they really did make us chuckle as we played on. This is a hugely popular game in our family - easy to play to start with and very easy to control, but becomes more of a challenge as you try to master the various trick shots. With these added 'special shots' anyone can still win, though, so the youngest can thrash the more seasoned player if they get their timing right. You can choose what is displayed on the Nintendo Wii U Game Pad screen to make it easier for you - here we have just a score board, but you can have it showing your player (with the TV showing your opponent in 2-player games). Mario Tennis: Ultra Smash is available to buy from Nintendo Official UK Store here. Since I met my new friend Sophie in Beaumonde City my life has totally transformed. Sophie had her own clothing boutique but as she loved my sense of style SO much she has let me take over the boutique. That's right, I'm the manager of my own fashion boutique in Beaumonde City where I am meeting LOADS of new people and making great friends. Sophie's been great at showing me the ropes. She told me about the Exhibition hall where I can buy more stock for the boutique. She's also taken me to Caprice Chalet - a pretty mysterious place where I can style my own miniature room in the dolls house in the attic. The room then becomes a real room in the chalet - how cool is that! I've also found the local cafe, hairdressing salon and park. It seems the longer I stay here in Beaumonde city, the more places I find out about and the more I can do. My absolute favourite thing to do is to make my customers happy in my style boutique. They come in with all sorts of requests and dilemmas and it's a great feeling to be able to find them just the item of clothing they were looking for. They are always so happy when I get it right! Of course, getting it right and selling them the right piece of clothing helps my bank balance too as the style boutique funds increase as more and more happy customers spend their money. I started out by looking like myself (well perhaps a younger version of myself), but after a few visits to the hair salon, I've ended up looking a bit different to how I started out in Beaumonde city. The hairdresser even dyed my hair blonde at one point! Oh and have I told you about Ricky? Well there's this guy I met called Ricky and there's something going on with him but I can't quite put my finger on it just yet. My other friends here have spotted him hanging around the boutique and even trying to disguise himself. He seems a nice guy so I don't think he's up to mischief. Perhaps he might like me? I'm sure the longer I hang around, the more I'll find out. I was beginning to get fed up of just helping people with one item of clothing here and there, but then I discovered that using an amiibo can get another person into the game (based on the mii character that the amiibo is linked to) and they need kitting out from scratch so that's a really fun way to give someone a whole new look and a whole new outfit. 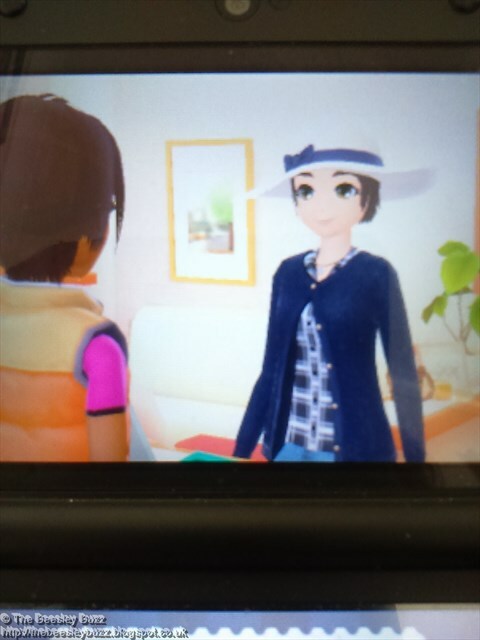 I even had one of the customers already in Beaumonde city come to me for a complete makeover. It was tempting to go really wild and create an outfit from my most unique and expensive pieces, but it turns out that you won't have happy customers if you compromise on style. Sometimes less is more as no customer likes a complete mish-mash of styles. What I love about Beaumonde city is that everyone is so helpful. Just by talking to everyone I meet I am learning more and more about this place. I also like that there are male and female characters. I haven't quite worked out whether I'll ever get the chance to style a male customer. There aren't any men's clothes in the boutique or stockists at the moment. But this place is full of surprises so who knows. Some of the characters wear spectacles. Which is great to see as spectacle wearers are usually hugely under-represented in games, magazines and on TV. The one thing I couldn't stand when I first arrived here was the girly girly level of excitement. Everything I said or did seemed to elicit lots of bouncing around with excited hands flapping around. But this has totally grown on me and now I love seeing the excitement in my customers faces when they are happy with their new purchases. lots of excitement like this from customers when you find the right item! I've even grown to love the little goodbye wave that I do when my customers leave the boutique. So now it's time to wave bye to you too. 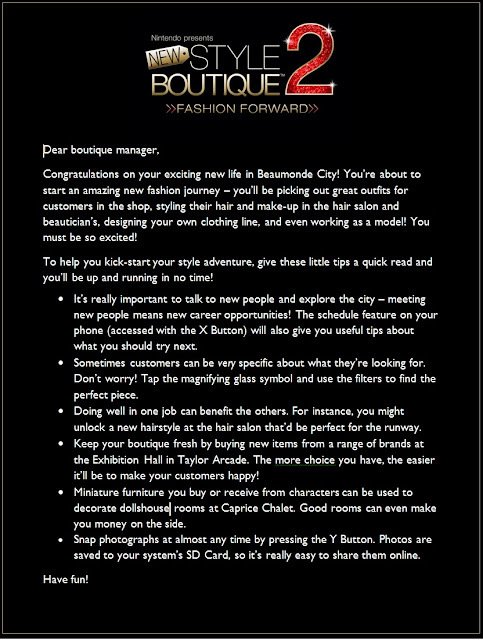 I'll keep you posted if anything else exciting happens in my boutique or in Beaumonde city. In the meantime keep your fingers crossed for a romance between me and Ricky. I love this place so much I've literally been dreaming about it! 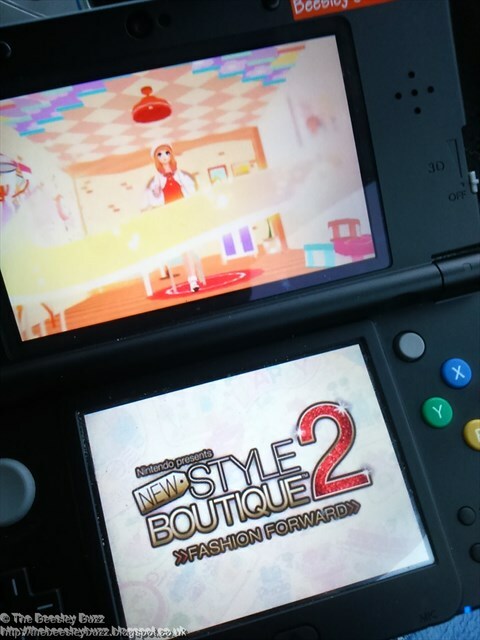 New Style Boutique 2: Fashion Forward is the brand new game from Nintendo for the Nintendo 3DS. I hope I've given a brief glimpse into this fantastic lifestyle game. I've been sent these top tips which really helped me out so I hope they'll help you too! The best tip for me was using the magnifying glass to help find the right items that matched with the customers requests. Although this game is rated PEGI 3, you need to be old enough to read fluently to fully appreciate the game. I think it's going to appeal most to tweens, teens and those in their twenties. I really got into it and enjoyed it despite my grand old age! Animal Crossing Amiibo Festival was our first encounter with the Animal Crossing games. The characters will be familiar to those who already know the hugely popular Animal Crossing games, but to us they were new. We were sent an amiibo pack with four of the characters and we soon had our favourites. Mine was Isabelle, J chose Cyrus to coincide with his own actual middle name, D's fave was Digby and Miss T insisted on having 'the dog with guitar' (K.K.). Miss T choses K.K. everytime! Having kids of varying ages (11, 9 and 3) it can prove tricky to find games and activities that we can all genuinely enjoy doing together. Most board games that we enjoy playing with the boys are too advanced for Miss T and most of the games she likes best are considered too 'childish' by J and D. So it's often a life of compromise (or arguments) - okay mostly arguments. So it was truly refreshing to find a game that ALL of us could enjoy playing together. Simple enough for Miss T to understand and get involved in and with challenges in the form of the minigames that engaged J and D to make it fun for them too. We all got to spend time together, without the squabbles and that was just brilliant! On Animal Crossing Amiibo Festival for the Nintendo Wii U, there is a giant board and you use amiibos to go round the board. There are special event spaces. There are also good spaces and bad spaces. Every Sunday you can buy turnips from Joan. On Monday the turnip prices are announced. The prices can go up or down during the week. When you play you can play for a month (which we are told would take around 1hour 15 minutes for 4 players) or set a time limit. The shortest time limit that you can set is 30 minutes. We have Cyrus, Isabelle, Digby and K.K. There are 8 amiibos that you can get. You unlock mini games by getting happy tickets. You then use amiibo cards to play the mini games. I have unlocked all of them. My favourite mini game is Balloon Island. In Balloon Island you have to hold the amiibo card on the gamepad and then take it off at the right time. Your character is floating. When you take off the card your character falls and bounces on the balloons. You have to try to get your character to land on the moving platform. Thanks to working as a team, along with J's persistence when the rest of us were busy with other things, we managed to unlock ALL the mini games in one weekend. Quite a feat I think as I reckon it would ordinarily take a lot longer but we love a good challenge in this family. I personally love how interactive this game is with the use of amiibos being vital in gameplay - you need to touch your amiibo to the gamepad each time to roll the dice. I think the amiibo cards features is also great for playing the mini games. This is something each of the children enjoy doing when wanting to play alone. But of course, the thing I love best is that we can all get together for that vital quality time as a family and play this game that we all enjoy so much! 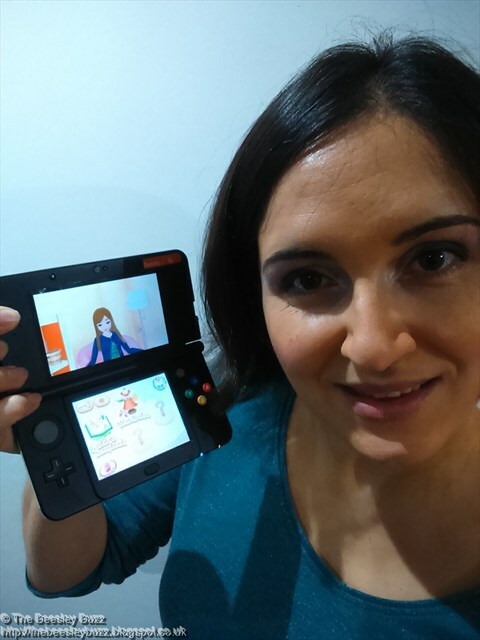 Disclosure: As Nintendo Family Bloggers we were sent a download code for this game along with an Amiibo pack. All opinions are our own.